Time to update our vision of public health in environmental policy? Since its initiation in 1968, the National Flood Insurance Program (NFIP) has aimed to reduce the impact of flooding on communities and individuals by providing affordable insurance for property owners and by encouraging and incentivizing communities to adopt and enforce floodplain management regulations. 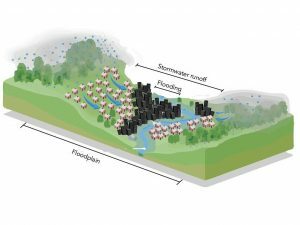 While the NFIP has helped many communities recover from flood damage and has encouraged safer building standards within floodplains, it has also effectively subsidized the costs of development in floodplains. As a result of this subsidy and the ever-increasing cost of flood damage, the NFIP is estimated to be about $24 billion in debt. 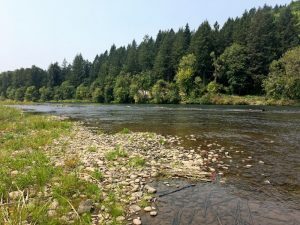 The link between NFIP implementation and increased development in floodplains has put it on a collision course with another, very different federal policy. Since 1973, the federal Endangered Species Act (ESA) has aimed to protect critically imperiled species from extinction. The ESA prohibits the take of listed species and requires federal agencies to ensure none of their actions or programs are likely to cause the extinction of species (“jeopardy”) or to adversely impact critical habitat for listed species. 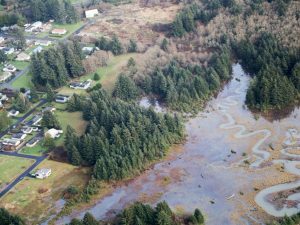 The conflict between these two policies first came into focus in 1994, when environmental groups sued the Federal Emergency Management Agency (FEMA), arguing that the agency was legally required to consult with the U.S. Fish and Wildlife Service over the impact their provision of low-cost flood insurance had on development in floodplains, and therefore on the endangered Florida Key deer. Similar cases followed in several other states, including Oregon. 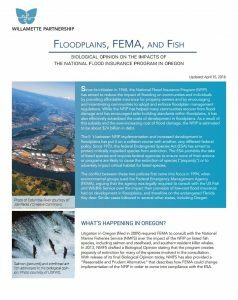 Read the full fact sheet about the biological opinion on the impacts of the National Flood Insurance Program in Oregon.